Here are the January blocks for the Improv Scrappy Block 2017 Project. Work I am doing on other project does influence what I do with my improv blocks. The day I made Block 3 (shown above) and I had been working on a traditional log cabin block. The improv block has some elements of the log cabin courthouse steps design. I had also just finished the Dalmations in Diamonds quilt top, in which I was making triangles using the fold over technique. I used the same technique in the orange and brown strips in this block. Here are all my January Improv Scrappy Blocks. I've been putting their number on the back of each block so I can keep them in chronological order. That's easy now, but soon won't be! It's a new year and I'm starting a year long project! If you quilt a lot, or have quilted for a long time, you collect a lot of scraps that are just too good to throw out but hard to use up! 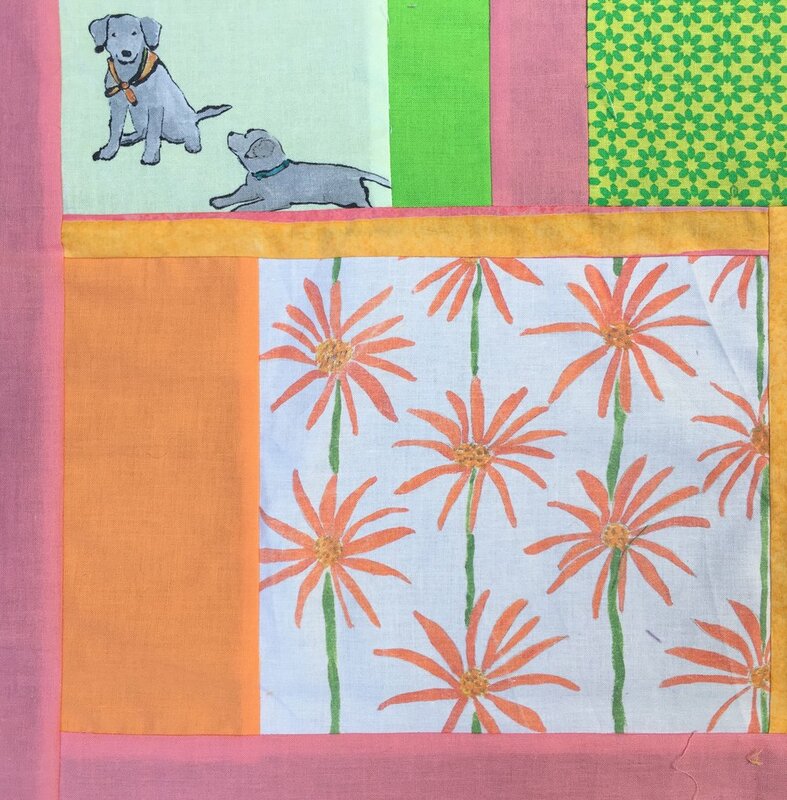 I want see how many ways I can use my scraps to create fun and interesting quilt blocks. 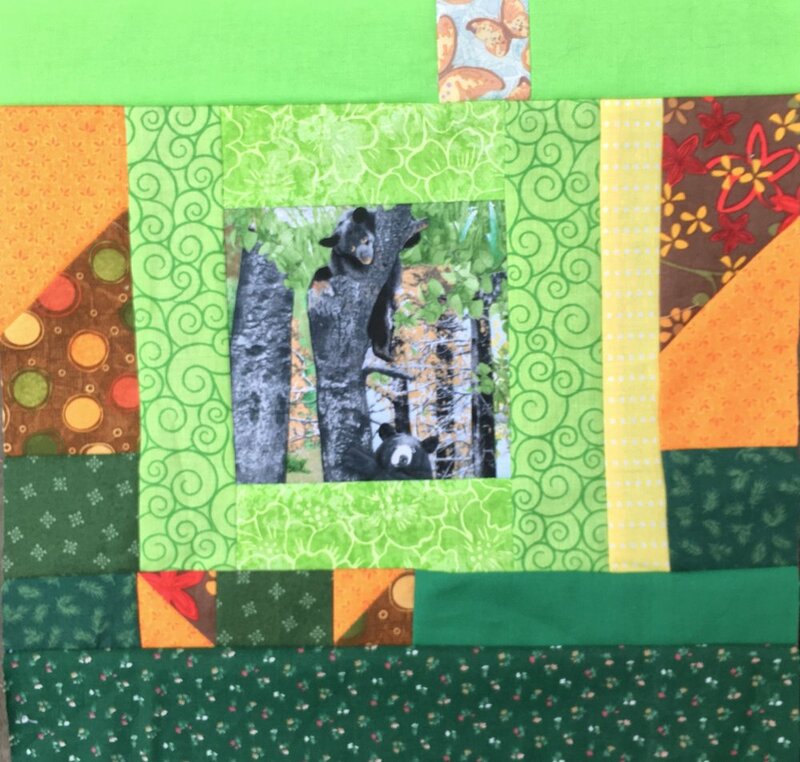 I plan to make 2-3 blocks Improv Scrappy Blocks each month so that I'll have at least 30 blocks, enough for a good sized quilt, by the end of 2017. Here are the rules I've set for myself. Blocks need to be pieced with intention. They can be color studies, interesting piecing or just fun to piece. The first 2 Improv Scrappy Blocks are at the top of this post. There is a simple slab, a hot pink color study, on the left and flying geese, a blue color study, on the right. If you have a stash of scraps you'd like to use up this year, please join the fun! I'll be posting my blocks here and on Instagram. If you are make blocks too, please post them using the hashtag #ImprovScrappyBlockProject2017. Thanks!! It turns out that a craft blog is a mighty hungry critter! Sometimes it is hard to keep up with it, Especially since I am blogging about projects that are all handmade! I love making and writing. I really enjoy this. But I've also noticed that there are days when the dogs don't get a second walk or I skip doing other things because I need to sew so that I have a project to write about. That's not so good. I have been posting on Mondays and Thursdays for almost 3 years now. This year I am going to try posting on a less rigid format. I want to write when I have something to share, not just to meet a deadline. Blogs tend to focus in on a theme. Mine focus has been primarily quilting, with some doll making and a bit of surface design, drawing, band weaving and rarely cooking. Expect to see more on all these topics, though I will probably make fewer quilts this year. So my loyal subscribers and faithful followers, for now, expect to find a new post most Thursdays. From time to time, I expect I may post more than once a week. I'll see how it goes! Please feel free to leave comments and let me know what you are thinking!